3CX – developer of the popular software PBX for Windows - 3CX Phone System, and Beronet – an industry leader in VoIP gateway equipment – announced today a strategic technology partnership that pairs 3CX’s software-based IP-PBX with Berofix VoIP gateways. The partnership ensures that both companies will commit to do ongoing interoperability testing, ensuring that customers can buy best of breed VoIP software and hardware, yet still be assured of an end to end solution supported by both vendors. The IP PBX and VOIP Gateway certified interoperability allows companies to immediately realize the cost-saving benefits of VoIP, whilst utilizing existing ISDN lines and thus enabling a gradual transition to VoIP. The Berofix VoIP Gateways are available as add in cards or as separate stand alone units. In both cases they fully support virtualized environments and do not require operating system drivers. The range starts with 4S0 (4BRI) and goes up to 4E1 connections. The cards can be upgraded allowing the customer full flexibility. A GSM and Analog interface module is in development. 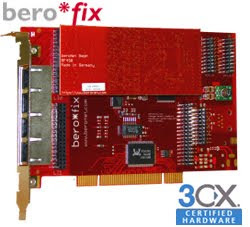 Selected 3CX and Beronet distributors will be offering special bundle pricing. To read more on this article, click here. 1 Response to "3CX and Beronet announce strategic partnership to provide complete IP PBX solution"
I came across your blog through a google search while looking for people and websites related to 3CX. With this I would like to inform you that we have published a book titled The 3CX IP PBX Tutorial by Mathew Landis and Robert Lloyd, that helps you to develop a fully functional, low cost, professional PBX phone system using 3CX.